Panda Helper is one of the top third-party installers available these days. With a huge choice of modified and tweaked content, you won’t ever be stuck for something to download and one of the most downloaded apps from Panda Store is Pokémon Go. Not the stock version, a modified version that has loads of extra features that give you an edge, making it a more competitive and enjoyable game. The stock version of Pokemon Go is a popular app, a game that lets you go about your daily life while hunting Pokémon, catching them and training them to fight others. With built-in augmented reality and your device GPS, you can ‘see’ the monsters wherever you are. The modified version takes the game to a new level, adding new features to enhance the game. Downloading the modified Pokemon app requires you to download Panda app first. Neither can be downloaded via the official app store but the tutorial below will walk you through how to get both Panda and the Pokémon Go hack onto your device. Update iTunes to the latest version if needed then go to the link below for a tutorial on downloading Cydia Impactor and installing the PokeGo++ IPA file from this ( link ) version R89 . Pokemon Go is one of the most downloaded games of all time, will millions of global users every day. 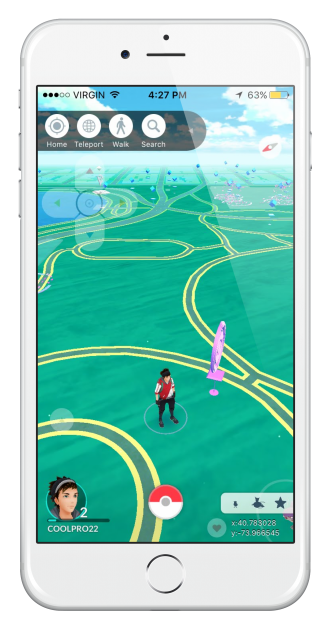 The tweaked version of the app is much safer to use, eliminating the need to be out looking for the Pokémon – we’ve all heard the reports of accidents, including vehicle accidents caused by people not concentrating and this hack takes the danger out of the game. Download the PokeGo++ hack from Panda Store and tell us how you get on using the comments box below. Don’t forget to explore the appstore as well; it offers many more exciting apps and games for you to try. Stay updated with all the latest tips by following us on Facebook. Is Panda Helper App Safe? hii panda helper.. is it possible to mod pokemon duel ? Why I cant find pokemon duel mod in your apps ? and what does it mod ya ? gem?because as what I know , there is “someone” selling cheap gem out there and I believe either they use mod to hack the gems , glitch/leak during making the purchase , or they hack itunes/android pay. then can you guys hack the gem of pokemon duel? why dont you check if any of the Panda Helper free – alternative apps have them in their store. I’m trying to download the Pokémon go hacked app. I recently updated to iOS 12. When I download Panda Helper and then the Pokémon go it just stays loading. Is it even available to me or do I have to wait for an updated version? Hi Stacy, if its not working for you with direct download. you can try downloading the PokeGo++ ipa file and install it using Cydia Impactor. All instructions are in our pokego article. Is it safe using pandahelper pokemon go cuz i just got softbanned when i try to uninstall and reinstall due to the updates i just got shadowbanned when i reopen and login with my account what happen are you gurantee the safety ?